A New Papa. A New Day. A New Ghost. Ghost (often referred to as Ghost BC) has called upon us to attend another Mass. 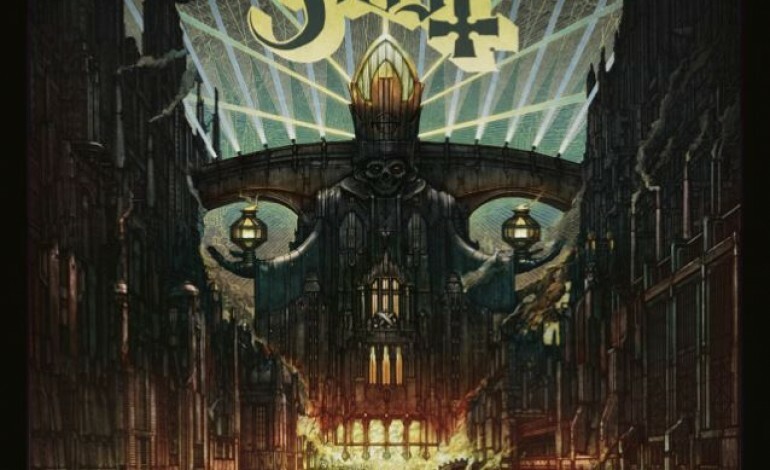 Their new album Meliora, released Aug 21st, has brought us another chance to listen to the dark spirits that sit in the pulpit. From the opening notes of the album’s first track “Spirit” to the album’s closer “Deus in Absentia,” we are taken on a ride through a dark, gloomy black metal that at times even borderlines psychedelic. It’s their calling card. Well that and the shows have the production value of an action movie. This album is in particular very interesting because it is the first with “the new Papa,” who as of this writing has left due to “not performing his duties in overthrowing governments and churches.” His brother was added to replace him live. So far the difference isn’t dramatic and ghost fans can be assured that Pulpit will not suffer at the hands of a new Papa. Songs like “From the Pinnacle to the Pit,” the best song on the album hands down, can keep us assured of that fact. It sports the usual vocal delivery, dark satanic lyrics and a big time riff. It could be their best song to date. What is truly exciting about Meliora versus the others (2010’s Opus Eponymous and 2013’s Infestessium) is that the psychedelic influence is much more profound than on previous releases. That is a good thing. Their black metal roots will always be there but on songs like “He Is,” which sounds like it could’ve been lifted from any Jefferson Airplane album instead of a Pentagram album, you get to see how much a deep breath the ghouls have and how much they can take their influences with them. Ghost is a band you have to see to believe. To be a member of the live show audience is almost breathtaking. Now, with Meliora, they have the album to back that up. Unlike their other releases this album is top to bottom good and it will have the choir singing back to the priest. So put on the black jeans, black shirts and let’s go to mass.